"You can pretty much get Mexican food like tacos and burritos in just about any corner of the country these days. 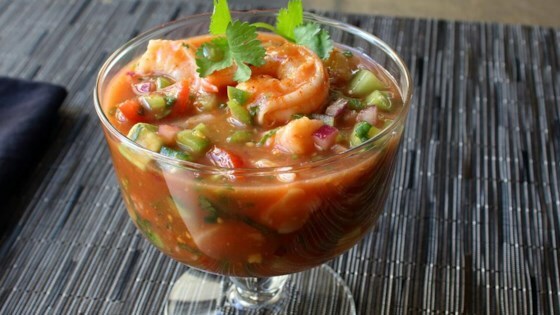 However, Mexican Shrimp Cocktails don't seem to have caught on elsewhere as they have in the Bay Area. Here's my version--you can adapt your own recipe using the listed ingredients and amounts as a rough guide." You can substitute 1 1/4 cups quartered small cherry tomatoes for the diced tomatoes. This was pretty good! I think I may have added too much cucumber BC it tasted a little watered down. And next time, I’ll add more avocado! I mean, ya can’t go wrong w more avocado!!! The best and I have tried many! Made as instructed best cocktail I have had! Absolutely delicious. Really a crowd pleaser! added 1/2 red and 1/2 yellow bell pepper.